Lava from Kilauea's last remaining active fissure erupts in what used to be the Leilani Estates neighborhood, near Pahoa, Hawaii, on July 14. Still, any reprieve is welcome news to the residents of the Big Island's Puna District, who have been living in a state of uncertainty since the eruption began on May 3. During the eruption, lava flows stopped and started from dozens of fissures, destroying homes and rendering roads impassable. Lava bombs rained on residents and injured nearly two dozen people on a tourist boat. 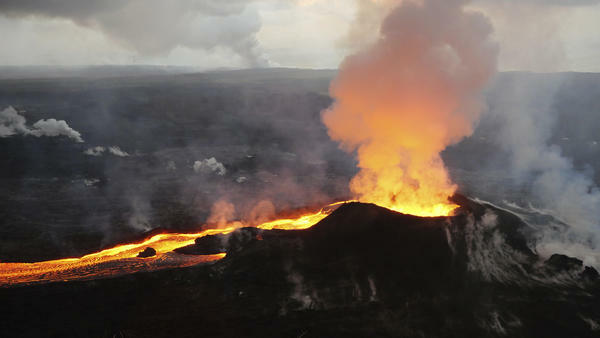 Eruptions from Halemaumau crater, the volcano's summit, rattled the earth and forced the closure of much of Hawaii Volcanoes National Park. The park's closure and fear of the eruption sent ripples through the Big Island's tourism-dependent economy. For much of the past two months, attention has focused on Fissure 8, which spewed and gushed lava while others quieted. Lava from the fissure formed a channel that carried it toward the island's southeast coast, where it has been entering the ocean, sending spectacular plumes of steam and laze — a mix of hydrochloric acid and steam with fine glass particles — into the air. The Hawaiian Volcano Observatory says that activity and lava output from Fissure 8 lessened in recent days and remains low. The slowdown couldn't have come at a better time. State officials and residents are now preparing for the effects of Hurricane Hector, which is expected to pass south of the Big Island on Wednesday. The storm has weakened but is still forecast to potentially bring big swell, high winds and rain.